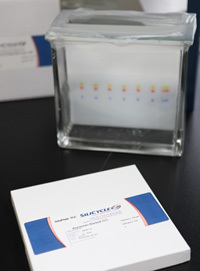 Thin-layer chromatography (TLC) is a quick, simple, inexpensive and extremely versatile technique for analytical and/or preparative analysis. Widespread in numerous of scientific fields, it is particularly popular for reaction monitoring & screenings, compound contamination assessment and sample purification. High sample throughput capability (up to 20 samples simultaneously). SiliaPlate represents an efficient and economical alternative to other TLC plate manufacturers while demonstrating high separation power, which is due to our narrow particle size distribution silica gel. The extraordinary silica layer hardness combined to a homogeneous coating and layer thickness allows excellent separation. Each TLC batch is chemically and physically controlled by our Quality Control department to ensure lot-to-lot and layer-to-layer reproducibility.